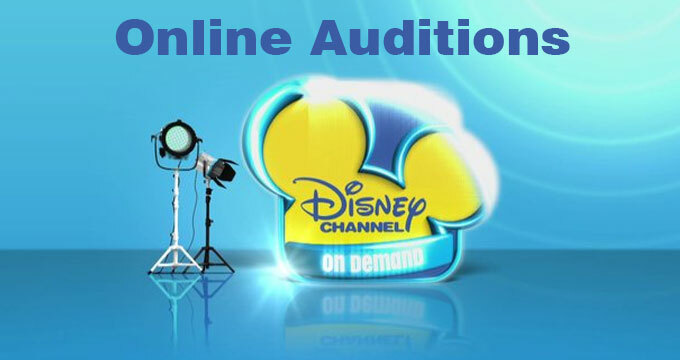 For kids who have been dying for a chance to try out for a Disney casting director….. here is your big chance to audition for Disney online. The official Disney Channel casting call has just been announced. If you have been asking the question of how to audition for Disney Channel, here it is. The official casting call begins today and will run through the 6th of August giving talented kids and teens a bit of time to perfect their Disney audition videos…. Yep, this year, the Disney casting call is being done online giving kids all over the United States a chance to be seen by Disney Channel’s casting directors without having to ever leave their home. This is great news for kids around the country who have the talent to be a star but just never had the opportunity. The Disney talent search is accepting submissions from kids and teens between the ages of 10 and 17. The casting directors are looking for talented kids who have a passion and desire to act. The online tryouts are being done through an app. Looks like Disney partnered with applause and talent will first have to download their app in order to get the sample Disney script as well as further instructions on how to upload their audition video. All the details are on the graphic / flier below. This will be the first time… ever, that Disney Channel & Disney XD are holding the event online. The annual call has been a staple in the summer for many years. 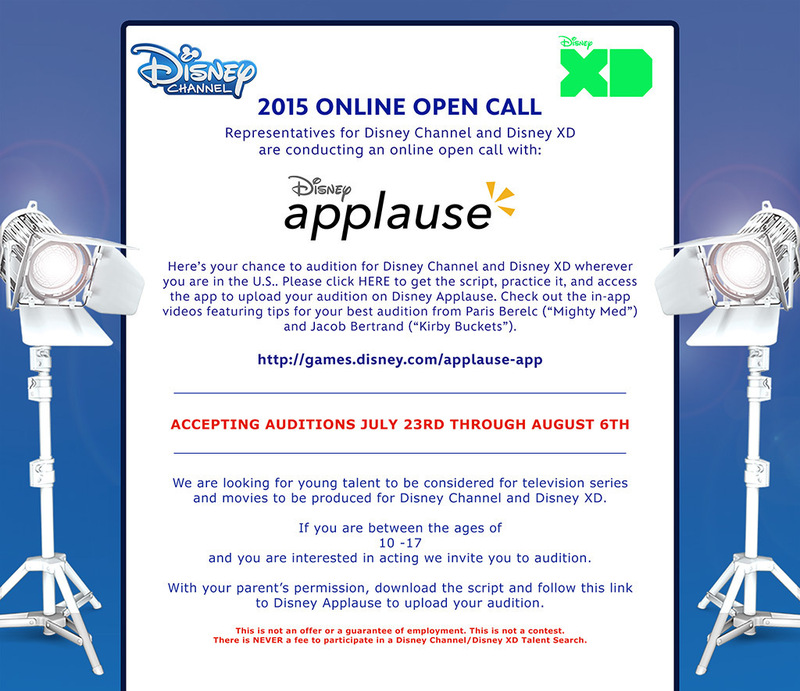 Every spring around May, the Disney Channel and Disney XD announce their annual open casting call. Disney holds it’s official auditions only once a year and each year they pick a new city to hold the event in. Last year the Disney Channel auditions were held in the Los Angeles area. The event got quite a few Disney stars discovered, most notable, Selena Gomez…. whose Disney audition video you can check out at the bottom of this page. Kids and teens interested in being cast for a Disney show must get their act and audition videos together by the 6th of next month which is the deadline. If you miss the opportunity, the next time the Official Disney Channel casting call will come around again will be the summer of 2016. These particular auditions are not for any specific roles or shows, they are actually a search for new talent that they would like to feature in upcoming Disney Channel shows, Disney XD shows for the teens or movies. That means that there are no specified roles or a number of kids they are casting for. The companies casting directors are looking for kids they would like to use in future shows. The casting call is part of their effort to find new talent for upcoming shows and series. This is also a good way for people that do not have an agent to get that Disney audition and show off what they got to the casting directors that make the big decisions about who gets cast in their new shows and movies. So, if you know you have the skills, talent and ambition to be the next big breakout Disney Channel star, don’t miss this opportunity to send in your audition video because the next chance to do it, will be a year away in 2016. Again, you have up until the 6th to get your submission in, so take your time and make it a great one! Now, check out the audition for Selena Gomez who got discovered at another annual Disney Channel open casting call. I want to act on disney channel and to be inspiring to others. I hope to become a great disney channel actress. My son is 11, hair type dirty blonde, he’s a show off, he’s handsome, he knows how to play drums and his eye type is green. My son’s name is Luke Tucker. Info: age 10, eyes green. He knows how to play drums, a little guitar. He’s a show off and about to turn 11. He would like to be on any thing.